I’m super stoked about announcing the Idiot Box Effects D4 Distortion Give Away! I love businesses like Idiot Box Effects. 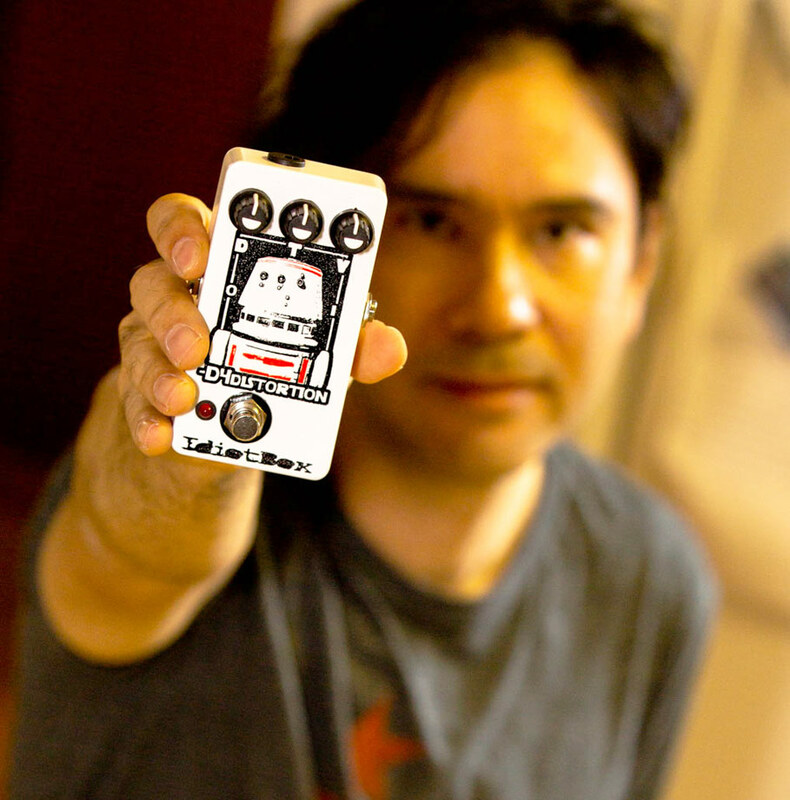 We’re talking about a completely DIY endeavor where Matt does basically everything involved with the pedals. From etching their own PCBs, silkscreening their enclosures and designing their circuits. I love that kind of commitment and entrepreneurial spirit to develop something and putting something out there. It takes a lot of guts, some luck and incredible amount of hours to make it a success, and Matt of Idiot Box Effects is well on his way. Additionally, I like businesses slightly on the ‘weird’ side and based on their products, they’re offering some interesting and unusual pedals. So I’m incredibly excited to announce the Idiot Box Effects D4 Distortion Give Away. You like Star Wars right? You remember episode VI (A New Hope), well where C-3PO and R2-D2 where picked up, there was the R5-D4 droid.. red and white. You remember… right? I loved that that they named this particular distortion the D4 Distortion with the droid as the graphic! …this is exactly what it says. A good distortion pedal that has plenty of volume and gravelly gain on tap with a true tone that will boost or lower highs. At high gain it can get a little muffy, at lower gain it is looser and can work as an overdrive with a bit of chest hair on it or even tap into rodent territory. Hitting a hot tube amp with the -D4 gives it some serious \m/etal vibes, almost like a JCM 800. ROCK N ROLL!!! So let’s talk about the give away. First.. I want to thank Idiot Box for offering this guy up. Definitely, check out Idiot Box Effects. They have lots going on, and their pedals are top-shelf all the way! Check out their site and their Facebook page! The Idiot Box Effects D4 Distortion pedal normally sells for $99, so this is a great opportunity for someone!!! I’m going to a random entry on April 7th. I will email that random entry asking for the answer to the question listed below. You will have 24 hours to respond with the answer. If the 24 hours passes and I don’t hear from that finalist, I will select a new random entry and repeat the process until I receive confirmation from the winner. This is open to everyone. Yes, that means international! Also, one entry per person. Please read that last sentence again… “one” “entry” “per” “person”. The submission form will be open until April 7th (Tue) 2PM MST. So, it’s pretty much a no-brainer to like Idiot Box on Facebook! Just click ‘like’ below. Please take a moment to Tweet, Share, Email this give away to your gear friends. We all like free gear right? So the question is: What was your last music related gear purchase? Thanks for the giveaway! Good luck everyone!